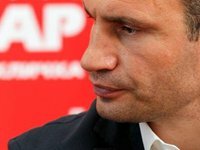 Leader of the UDAR Party Vitali Klitschko says that every opportunity should be used to avoid bloodshed in the country. "We've got two scenarios. The first is not to go to negotiations [with the authorities], the scenario with the use of force could turn to be unpredictable, and I don't rule out a civil war… And in this case we'll use every opportunity to avoid bloodshed," Klitschko said on Hromadske.TV live television on Sunday evening. The temperature in the society has reached the boiling point, and ways should be found to settle the crisis, Klitschko said.